Guillermo Del Toro's tale of giant monster mayhem came in third place in American cinemas on its opening weekend. 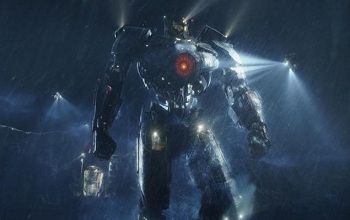 If Pacific Rim seems like a no-brainer, it's because it is. A movie about giant mecha rocket punching giant monsters is probably the best idea to come out of Hollywood since the advent of the lightsaber. That being the case, mainstream America has once again proven that it thinks somewhat differently from geek America. Pacific Rim underperformed on its opening weekend, being beaten at the American box office by Despicable Me 2 and Grown Ups 2. Now there are some important asterisks to pin on to this news. Firstly, while it perhaps disappointed, it didn't flop. It managed to bring in $38.3 million in the United States and $91.3 million worldwide, putting it well on track to match or even exceed totals earned by films like Rise of the Planet of the Apes, World War Z and Prometheus, which earned between $300 and $400 million. Likewise, Pacific Rim has currently only opened in about fifty percent of global movie-going markets, giving it a lot of room for further profitability. That being the case, you still can't help but feel some twinge of sickness to think that, in this day and age, people would rather line up to see a sequel to a mediocre Adam Sandler film as opposed to a movie where giant robots beat skyscraper-sized monsters to death. If you needed proof that this is a world without justice, look no further. Better yet, stop looking for justice and go see Pacific Rim. The future of monster versus mecha movies may depend on it.